Polished Concrete Toronto | Floor Polishing | TTM Finishes Inc.
Polished Concrete at Daytona Auto by TTM Finishes Inc.
Polished Concrete for the Science Centre. Polished Concrete Floor in an office at Business Information Group. North Face Store Yorkdale shopping mall applying Ardex PCT Polished Concrete Topping to create new floor. Installation of Polished Concrete Overlay using TRU Rapid Set Concrete Overlay with some aggregate and then polishing of finished concrete floor. American Eagle Outfitters store at the Regent Mall in Fredericton, New Brunswick. Installation of Ardex PCT Polished Concrete Topping Overlay and then polishing of finished concrete floor. Aritzia store at the Lime Ridge Mall in Hamilton, Ontario. Whether you are installing a new concrete floor or are considering polishing your existing concrete floor, TTM Finishes can help. 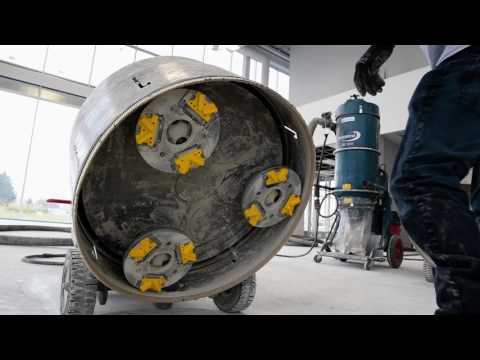 With more than 15 years of experience grinding and polishing concrete floors, we have the know how and the concrete finishing equipment needed to reveal the hidden beauty of your concrete floor. Before we begin polishing your concrete floors, we’ll take the necessary preparation steps to ensure a flawless, long-lasting finish. Concrete polishing also creates a durable long-lasting finish to your floors, so you’ll save in the long-term on maintenance costs. Unlike carpet, which needs to be cleaned every six months, or hardwood which is expensive to refinish, concrete floors can be re-polished every 3-5 years at an affordable price. For schools, sports facilities, hospitals, stores and warehouses with heavy foot traffic, polished concrete floors make the most economical sense. Not only will concrete polishing make your floors look beautiful, polishing also serves a more practical purpose. Concrete polishing adds lustre to the flooring surface, increasing the amount of ambient light the floor reflects. Your area will appear much brighter and much more open. But don’t let the glossy finish fool you. Concrete polished floors are nonslip and abrasive resistant – perfect for areas with heavy foot traffic or where material handling equipment is operated, such as shop floors or distribution centres. Compared to carpet and tile grout – which can harbour dust mites and mold – concrete polished floors are a much more hygienic surface. They can be easily cleaned and disinfected without any risk of damage to the floor finish. Choose a long-lasting and beautiful finish for your floors. Contact us to book your concrete floor polishing service.